Kate's new laptop is a Powerbook Duo 280c. Eugene attempts to bribe Dade by sending him a new clear-cased Duo 280c. Kate uses the Powerbook for all her hacking exploits. Silly graphics, and of course this is the Apple that is infamously described as having the "new P6 chip". hi! 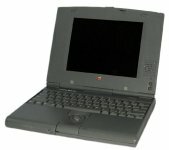 but Kate used powerbook duo 280c! it`s very good laptop. Yes, the 2300c had a touchpad and there's a trackball. So it's 280c indeed. Anyway, it was really great machine for the time. 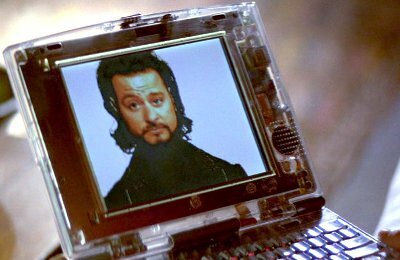 does anybody know what computer that he use in the begining of the movie when he hack the network tv? I think it is safe to say that the writers did not mean to say that the Duo had a <a href="http://en.wikipedia.org/wiki/P6_%28microarchitecture%29? ">P6</a> Intel CPU. They made a big deal out of it being a RISC CPU. At the time there were a lot of exciting RISC CPU options. The 280 was the last CISC duo, a little over a year later the RISC based 2300 came out. Mr Mouse, the P6 was being based on a new risc subsystem. The powerpc which was coming was a fully risc cpu. You can play this both ways. The problem is in 1995, how many chips are known by general audience. Yeah, they play with words here, but movie is not knowing for realism. It is very unrealistic movies, much less realisms than earlier Sneakers movie. Also to note are two more details. Computer has 'millions' of colours (actually is only 16bit, although a 24bit palette), and 28.8k modem (internal modem was only 14.4). I like this film, but wonder what other computers are using? 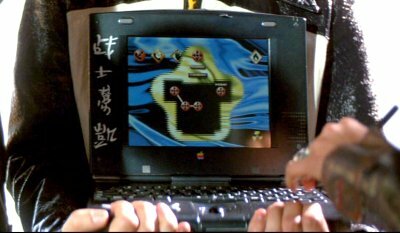 There is computer used by bad man, computer used by lamer Joey (some kind of apple desktop) and computer/s used by Dade (Crash Overide) himself. So much to explore. Pretty sure that Kate's laptop was a PowerBook Duo 2300c. To build Kate's laptop you will need; The bezel case piece in front of the keyboard from a 270c because there is no writing. The screen or screen bezel from a 280c screen assembly because it has no writing only Apple emblem. System board from a 2300c However the plastic is a darker color that only seems to match the case color of the Newton. Which means the laptop is probably also a prototype. Paint or plastic lacquer might work. Have been unable to find a 28.8 or 19.2 bps modem that was ever made. Most of what was said was Apple marketing information. This might at one point been a planned option...?